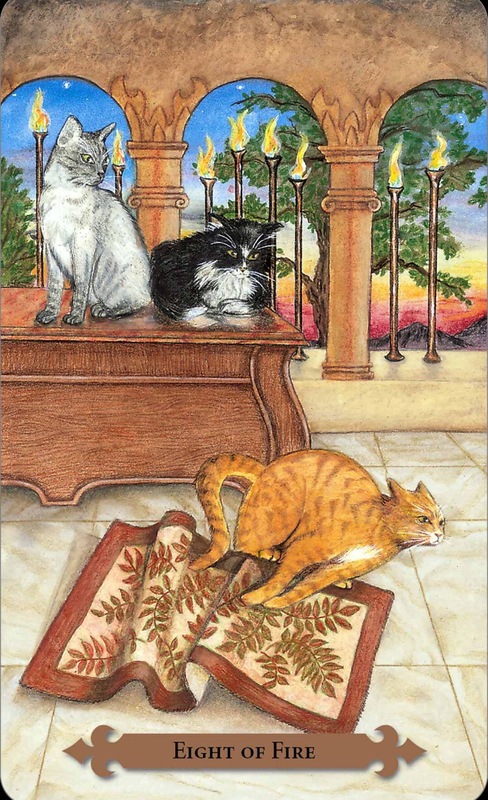 Card: XI Consequences – from the Mystical Cats Tarot by Lunaea Weatherstone. 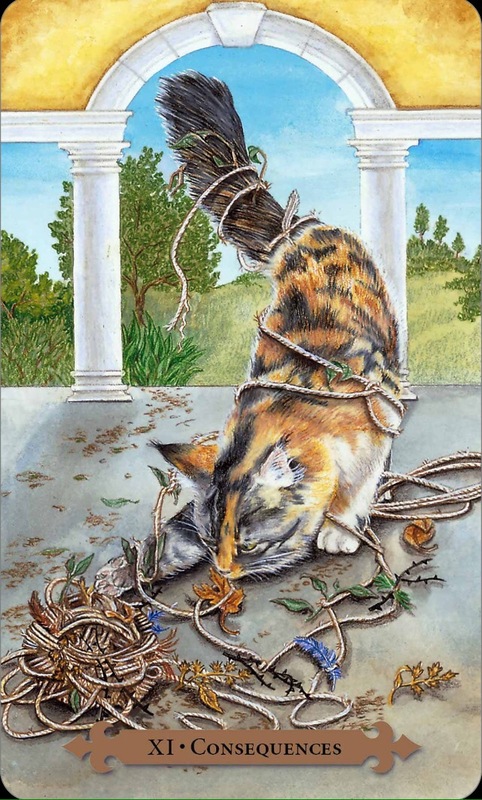 Message from The Faeries: The cat in this card has gotten itself all tangled up because it wasn’t paying attention. It was having fun in the moment playing with the yarn, not realizing it was getting all wrapped up. Of course, the imagery is metaphorical. 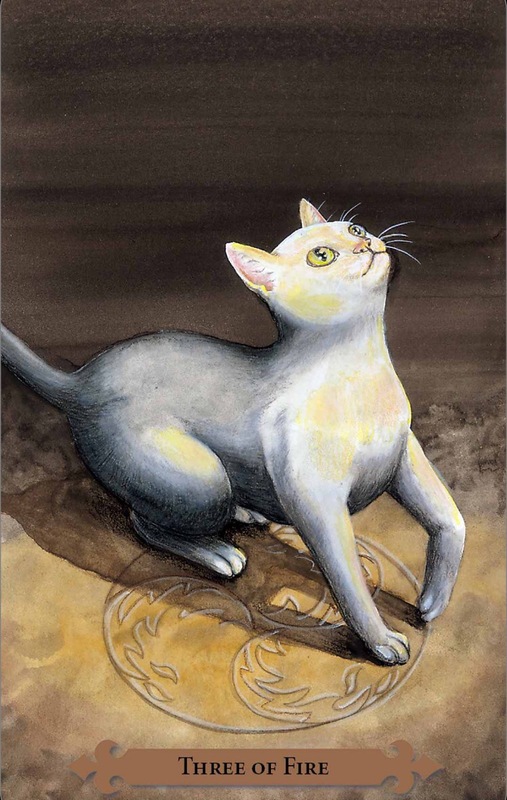 This cat reminds you to pay attention. Pay attention to what you say, do or think. There is going to be a cause and effect to everything you say or do, but don’t forget that your thoughts also cause a reaction. Everything is connected. If you aren’t paying attention all the time, then you are not able to see the big picture. Here is an example. Let’s say that one day you aren’t feeling well or you aren’t in a good mood. First of all, if you are having lots of negative thoughts, you are going to attract negative situations. If you have no control over your thoughts and feelings, how are you going to have control over whatever else is going to happen to you? You can see how easily your day can spiral out of control. We hear most of you complain that bad things are just randomly happening to you, but we can see that most of the time you have very much helped to create these situations. It all begins with you. Check yourself before you wreck yourself. 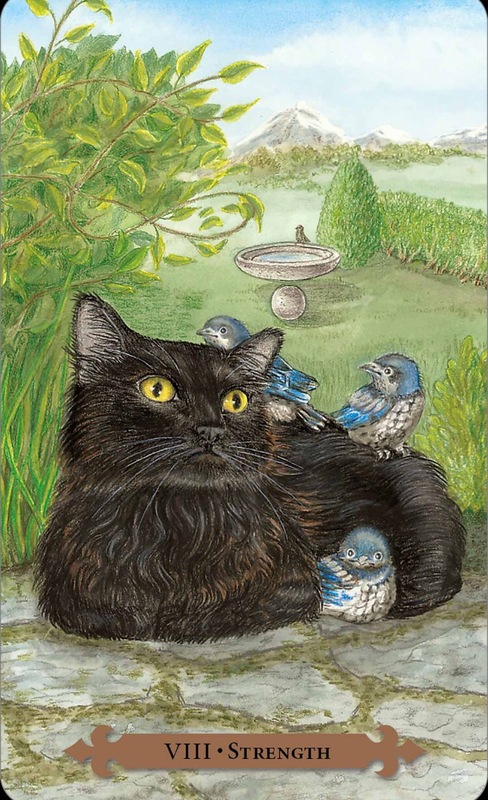 If you are feeling grumpy or you are unhappy- it’s okay to feel that way if you want to – but be mindful not to project it or feed into it. You are only making things worse for yourself. Take control of yourself and be responsible for yourself. Be responsible for your thoughts, feelings, actions and words. We’ve heard people say: I’m not responsible for other people’s thoughts and feelings. This is true, to some extent. However if you are feeling grumpy and you say a mean thing to someone – your words are your responsibility. So, if that person you are mean to decides to not hang out with you – it’s their choice, but you helped create that situation. Everything is connected and has a effect on each other. Please practice being mindful. Helpful hint: meditation really helps with this. 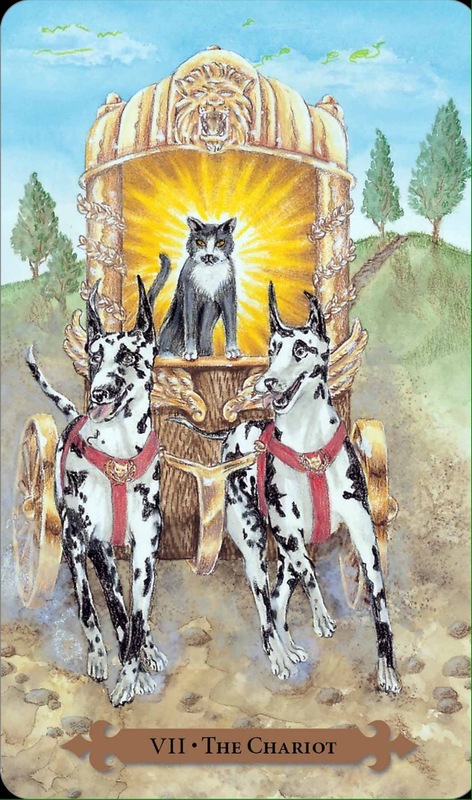 Card: VII The Chariot – from The Mystical Cats Tarot by Lunaea Weatherstone. 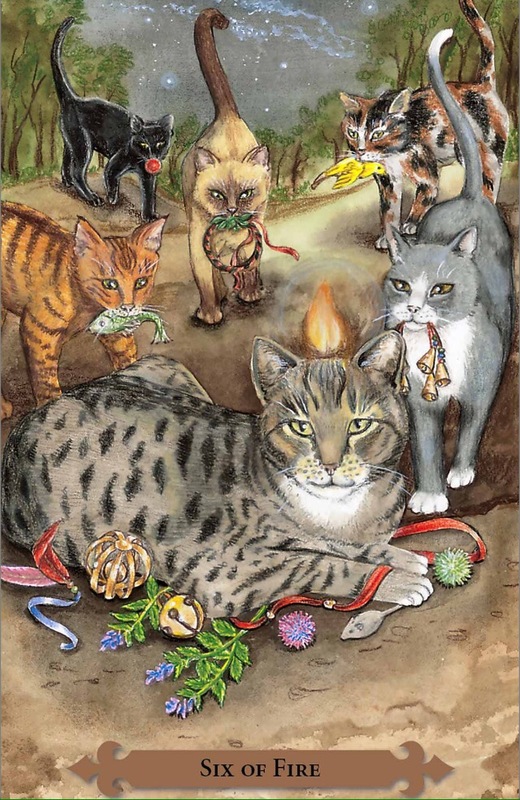 Message from The Faeries: This a week where you can be a real mover and shaker. 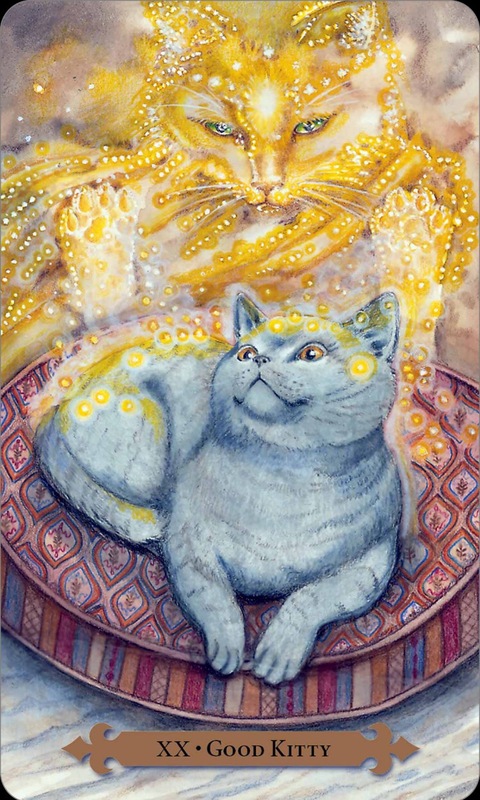 There is a particular energy around this week that can invigorate you, or at least give you a much needed boost. Don’t take this energy for granted. Use it to your best advantage. If there is something that you’ve been meaning to do in the last while, but haven’t had the energy to begin, this week is the perfect time to start. If there isn’t anything you need to do this week, then just enjoy the extra energy. Go for some nice walks or go out dancing. Do something fun! We would like to take this opportunity to remind you that although sometimes it doesn’t feel like you have much control over your life, you have a lot more say than you give yourself credit for. One of the difficult things about this reality is the free will of others. Yes, you have free will, but so does everyone else. This means that you can only really change yourself and you own life, to the best of your ability. Spend less time trying to figure other people out. It’s a huge waste of time and energy. Just do you the best way that you can, and don’t worry so much. When you are doing you the best way you can, you’ll have energy to give to other people, and you’ll inspire people to do themselves the best way that they can. 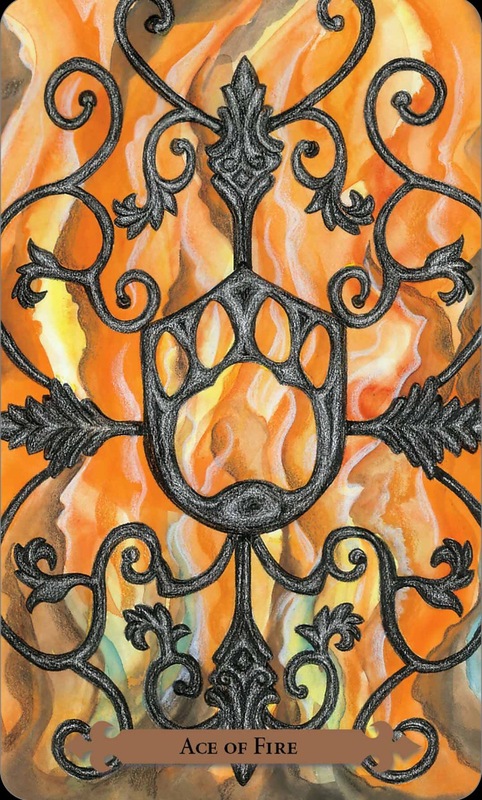 We wish you all a wonderful week.